With Naqoyqatsi, Godfrey Reggio’s “Qatsi” trilogy is finally completed. As each of the films was imbued with a distinct visual language, the music in like manner follows a development characteristic and distinctive to each film. The score for Koyaanisqatsi (1982) grew out of the instrumental style typical of the ensemble of keyboards, winds, and voice for whom I had been composing for some years. The movement of the film from the organic images of the American Southwest to the hi-tech accelerated life of modern North American cities was reflected in my version of a modern synthesized music. With Powaqqatsi (1987), we see the indigenous communities of the Southern Hemisphere impacted by rapid transformation through its encounters with the Northern industrialized world. Accordingly, one hears echoes of India, Africa, and South America in this ‘world music’ score. The use of percussion instruments from around the world further enhance this impression. In Naqoyqatsi (2002), Reggio turns to a visual language heavily dependent on digital, synthesized images. With this film, the “civilized violence” in the narrative of the film goes beyond anything seen in the two preceding films. In this case, I chose a contrasting language for the music, composing music for a large (acoustic) symphonic ensemble featuring a solo cello throughout. My instinct was to balance the quite startling effect of the synthetically composed images with a sound world of “natural” timbres. Furthermore, the solo cello — played superbly by Yo-Yo Ma — quickly emerges as the “voice” of the music, lending the score an overall human dimension. The score was composed in eight large sections, which made the present adaptation to CD a fairly straightforward affair, the music faithfully following the structure of the film. Of course, no multimedia experience, as presented in Reggio’s Qatsi Trilogy, can be represented completely in one medium alone. However, I feel quite pleased that, through a process of editing and re-mixing, this soundtrack version conveys as faithfully as possible the sense of the film. 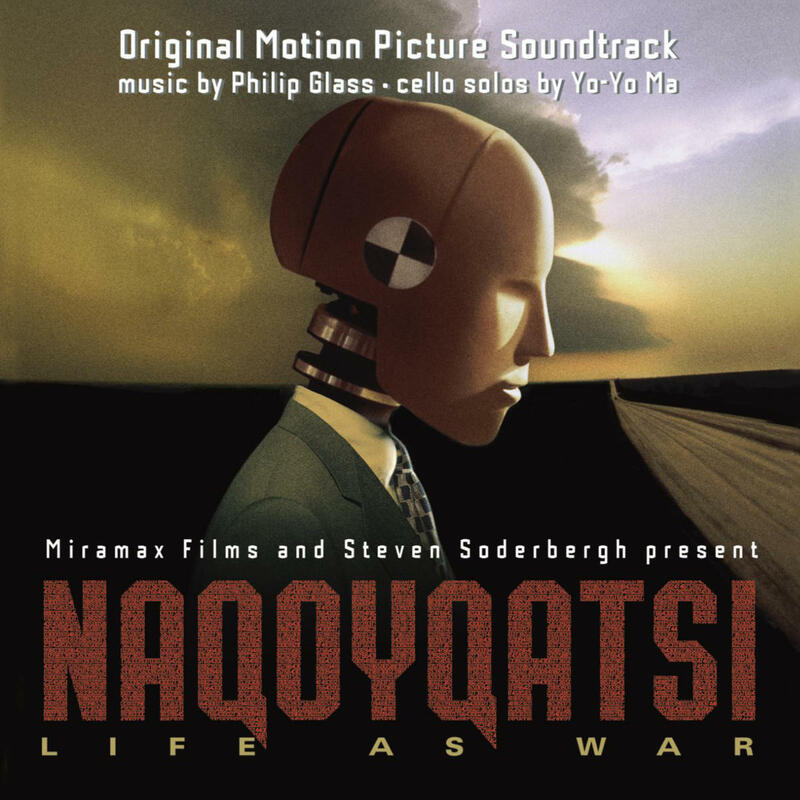 With Naqoyqatsi, Philip Glass completes an effort of twenty-five years, writing the scores for the Qatsi Trilogy. In doing so, he makes an original contribution to the progression of cinema: music that stands as co-equal with image. In effect, Glass has created a genre of film that stands apart — Concert Cinema — a form whereby the score becomes the emotive narrative of the film. Unlike its companion scores (Koyaanisqatsi and Powaqqatsi), Naqoyqatsi is unrelentingly acoustic, bringing a human presence to moving images that are digitally painful in their representation of sanctioned terror and civilized violence — the global technological order. To realize this task, Glass has written a musical utterance for renowned cellist, Yo-Yo Ma. In his interpretation of the score, Yo-Yo Ma’s performance stands as the emotive voice of Naqoyqatsi. Without a word, his strings bring inspiration and grace to a narrative that is beyond the ability of language to articulate. The vision of Naqoyqatsi is a world where union is held in the vice of technological homogenization; an order at war with old nature, where unity is held in the mystery of diversity. From the point of view of the film, untellable is our world at war beyond the battlefield, a conflagration between old nature and new nature, a total war, the war of ordinary daily living. To articulate such intenseness, Yo-Yo Ma’s voice touches in a place beyond rationality and story. His utterance reaches to that space between words, to the spirit, where feelings can touch the soul. In this, their first collaboration, Philip Glass and Yo-Yo Ma have created an artistic plateau akin to a force of nature. Their presence, the score, is analogous to oxygen, always present, giving life to the vision of Naqoyqatsi. Performed by Members of the Philip Glass Ensemble: Lisa Bielawa, soprano voice; Jon Gibson, soprano saxophone; Richard Peck, tenor saxophone; Andrew Sterman, flute, piccolo, clarinet; Michael Riesman, keyboards. Featured guests: Al de Ruiter, bass voice (“Naqoyqatsi” “Definition & Credits”); Mark Atkins, didgeridoo (“Point Blank”); Alexandra Montano, mezzo-soprano (“Intensive Time”); Sean McCaul, mallet instruments (“Religion”). Members of the Orchestra: Violins: Timothy Baker, Anahid Ajemian, Leszek Barnat, Joyce Hammann, Regis Iandiorio, Julianne Klopotic, Leonid Levin, Nancy Mcalhany, Jan Mullen, Linda Quan, Marti Sweet. Violas: Masako Yanagita, Alfred Brown, Stephanie Fricker-Baer, Jill Jaffe, Lois Martin, Linda Moss. Cellos: David Calhoun, Marisol Espada, Semyon Fridman, Gregory Hesselink, Richard Locker. Double Basses: Joseph Bongiorno, Gail Kruvand-Moye. Flute & Piccolo: David Wechsler, Timothy Malosh. Oboe & English Horn: Shelley Woodworth. English Horn: Melanie Carp. Clarinet: John Moses. Bass Clarinet: Virgil Blackwell. Bassoon: Frank Morelli. French Horn: Sharon Moe, Peter Gordon, Ronald Seli. Trumpet: Lorraine Cohen, Francis Bonny, William Rohdin. Trombone: James Pugh, Dan Levine, Keith O’Quinn, Dean Plank. Bass Trombone: Alan Raph. Tuba: Andrew Rodgers. Percussion: Sean McCaul Frank Cassara. Keyboards: Nico Muhly. Harp: Susan Jolles. Vocals: Tony Bouttè, Tenor; Paul Houghtaling, Baritone. Music and Soundtrack Produced by Kurt Munkacsi for Euphorbia Productions, Ltd. Executive Music Producer Jim Keller. Recorded and Mixed at: The Looking Glass Studios, New York, NY. Recording and Remix Engineer: Hector Castillo. Assistant Engineers: Mario McNulty, Christian Rutledge. Maintenance Engineer: Jamie Mereness. Additional Recording: Futura Productions, Boston, MA. Engineer: John Weston. Technical Consultant: Monte McGuire. Music Production Administration: Kara Bilof. Assistants to Glass, Riesman, Munkacsi: Nico Muhly, Max Giteck Duykers. Interns: Dawn Landes, Matt Gill, Dan Bora. Very Special Thanks to: Cristin Bagnall, Joe Beirne, Cat Celebrezze, Ryan Chingcuangco, Don Christensen, Pat Dollard, Dany Dryden, Alan Duke, Zachariah Eichman, Danielle Frank, Mark Gill, Linda Greenberg, Rachel Grundfast, Ramona Kirschenman, Mel Lawrence, Rachel Levy, Amanda Lundberg, Agnes Mentre, Tim O’Donnell, Karen Paul, Alisa Regas, Godfrey Reggio, Andrew Robbins, Eric Roth, Lisa Sandler, Rick Sands, Edwin Santana, Weiman Seid, Ira Singerman, Steven Soderbergh, Randy Spendlove, Danielle Stilli, Cynthia Swartz, Larry Taub, Bob Weinstein, Harvey Weinstein, Isabel White, Jim “Sparky” Woodward, Katy Zuker, and The Staff at The Looking Glass Studios. For the Theatrical Soundtrack: Sound Designer: Steven Boeddeker. Re-Recording Mixer: Martin Czembor. Re-Recording Services Sound One, New York NY. For Qatsi Music Studios: Director: Francis Kuipers. Assistant Director: Nathaniel Reichman. Studio Assistant: Patrick Inverso. Studio Apprentice: Matthew Griffin. Art Direction & Design: Lisa Sparagano. Motion Picture Artwork © 2002 Miramax Film Corp. Motion Picture Poster Images: 70009815 by Tom Bean/Getty Images and 982837.001 by Wayne Eastep/Getty Images. Package © 2002 Sony Music Entertainment Inc. Music published by Dunvagen Music Publishers, Inc. ASCAP.